Sunday, the first day of creation and the day of resurrection, is the time when we come together to hear the Word of God in scripture and to receive the bread and wine, the body and blood of Christ, at the Eucharistic table. In this gathering, our parishioners share their gifts in music and the arts to enrich our worship together. 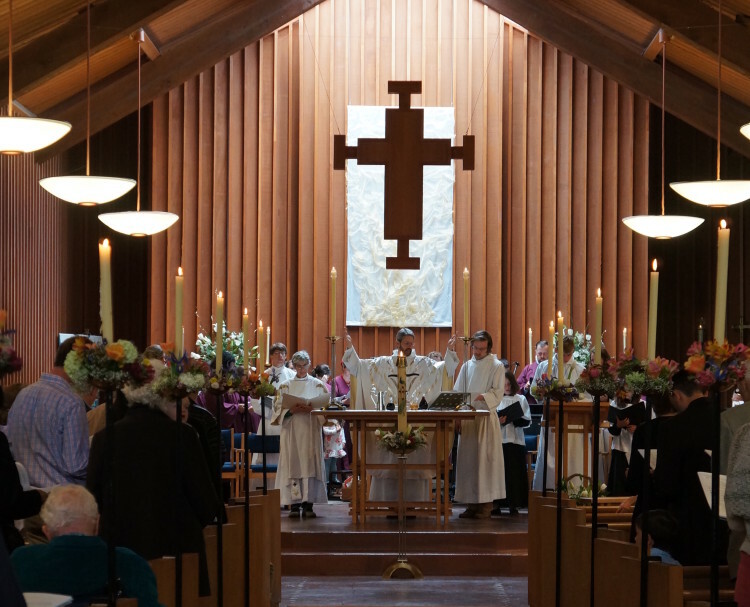 The basis for our worship is the Episcopal Church’s Book of Common Prayer, through which we share our liturgical heritage with the rest of the American church, as well as with others in the Anglican tradition around the world. We supplement our liturgical language with expansive images of God as found in newer publications such as Enriching our Worship, as well as drawing on a wealth of other resources both old and new, reflecting some of the diversity of our understanding of the divine. Our music is rooted in the breadth found in traditional hymns and shared widely within the Episcopal Church and the wider Christian world. In addition, we draw on a wealth of resources from the African-American tradition and more contemporary music for our congregational singing, the heart of our musical expression. Our traditional Parish Choir and bluegrass Angel Band are joined by other musicians playing organ, piano, trumpet, and many other instruments. Color, shape, and movement enhance our experience of beauty, God’s revelation that we receive through all of our senses. The progression of colors through the year, iconic figures such as the dove representing the Holy Spirit, and our processions within and around the church building all contribute to our understanding of the transcendent. The liturgical motto of our tradition is “Lex orandi, lex credendi”; the way we pray shapes what we believe. At All Souls, we try to continue that thought by adding “lex vivendi”, the way in which we live. In other words, it is in our gathering to create liturgy afresh each week that we grow in our faith, and from that faith, we are called to transform the way we live in the world. The spiritual nourishment that we draw from worship and our lives together makes it possible to live out our commitments to service, whether as individuals in our daily lives or as part of communal parish efforts to care for creation and persons within it.